Importing classes functionality allows an administrator to bulk create the classes in the system for teachers. After you create the classes, you will need to import class rosters or add students to the classes before your teachers can make assignments to their classes. Select Import Classes from within Manage Classes. 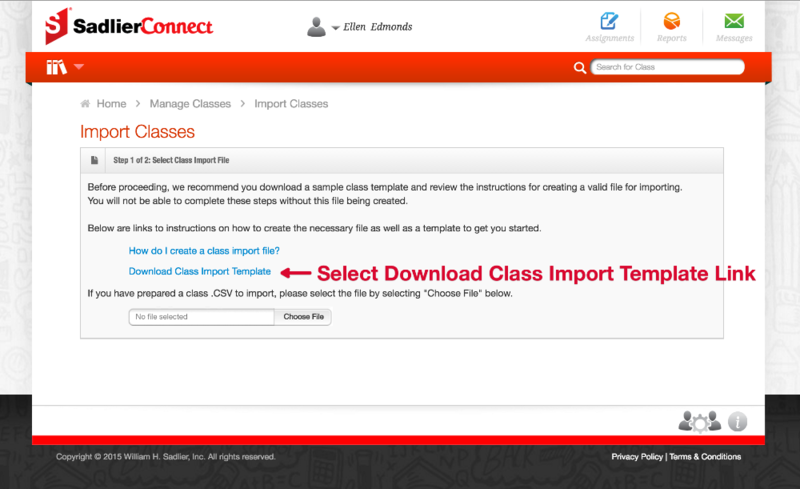 Select the Download Class Import Template link and save the file to your computer. Remember where you save the template file on your computer as you will need it in a couple of steps. 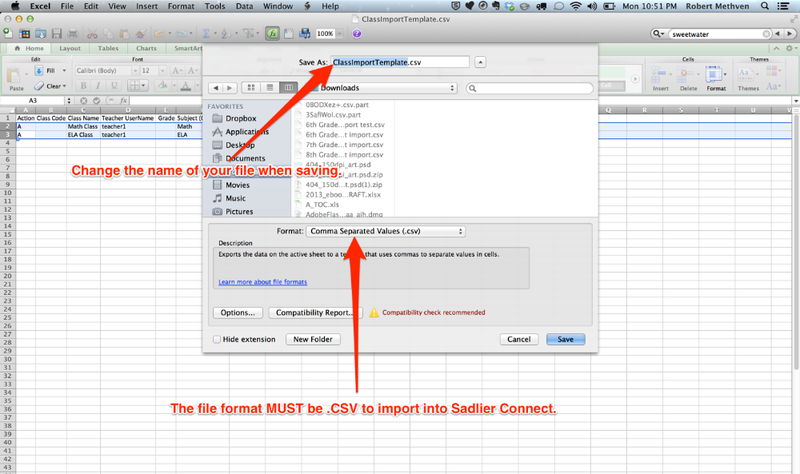 The file will be named ClassImportTemplate.csv unless you change the name when saving the file to your computer. 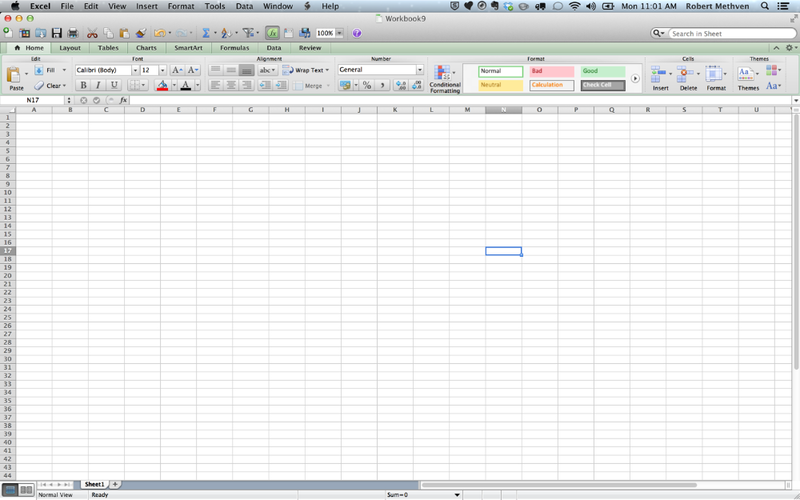 Once you have opened your template file, your screen should look similar to the one below: You can expand the widths of the columns in the spreadsheet. When you do you will see (Required) and (Optional) indicators after the column names indicating which fields are required and which are optional. See the Import File Column Information below for a list of fields, descriptions, and acceptable values. You should delete the two sample class rows provided when you are done so that these classes are not created in your account. 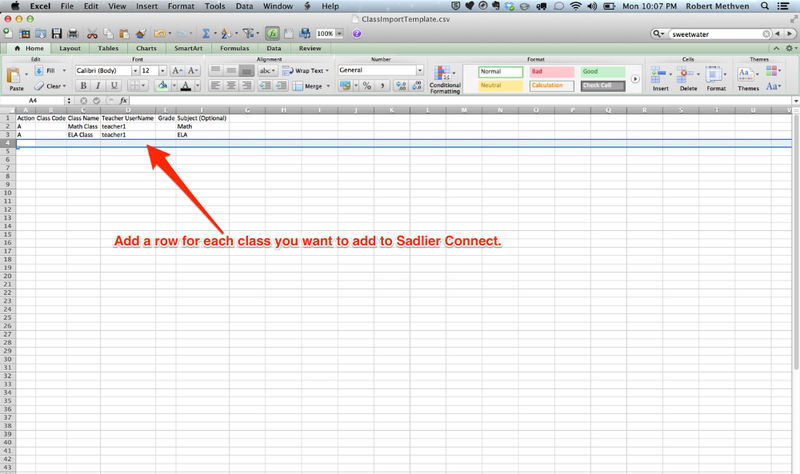 You will need to add a row for each class you want to create in Sadlier Connect. 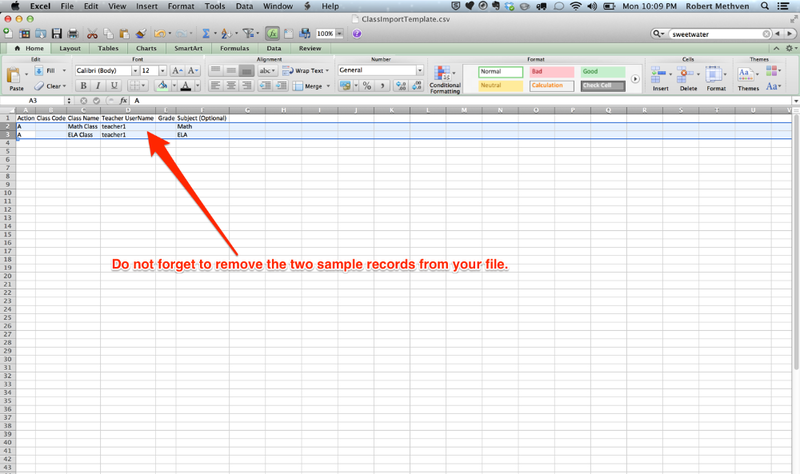 You will want to change the filename so you do not overwrite the template file you have downloaded. When saving you need to change the Format to Comma Separated Values (.csv). You now have a class import file that is ready to be uploaded to Sadlier Connect. 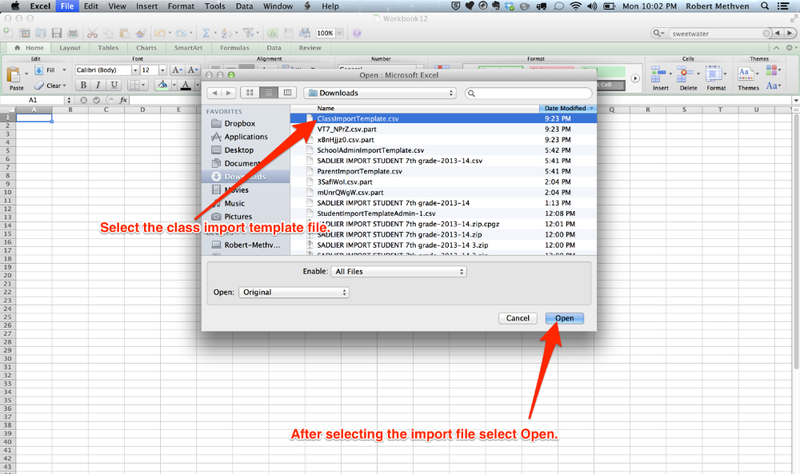 For assistance importing a class import file, see the article titled, "How do I import a class import file?". Column A - Action (Required): This column tells the system what it should attempt to do with the row of data in the file. The value "A" should be used when trying to add a class to the system. One would set to this value for the first time classes are being uploaded into Sadlier Connect. The value "U" should be used when you want to update an existing class account in the system. Column B - Class Code (Optional): This is an informational field that can be used if you have a specific class code for tracking classes in your school. It is not a code that would be used by students or other users, it is strictly informational in nature. Column C - Class Name (Required): This is the name of the class that will be used in the system. It will be used by administrators, teachers, and students as they access information related to the specified class. 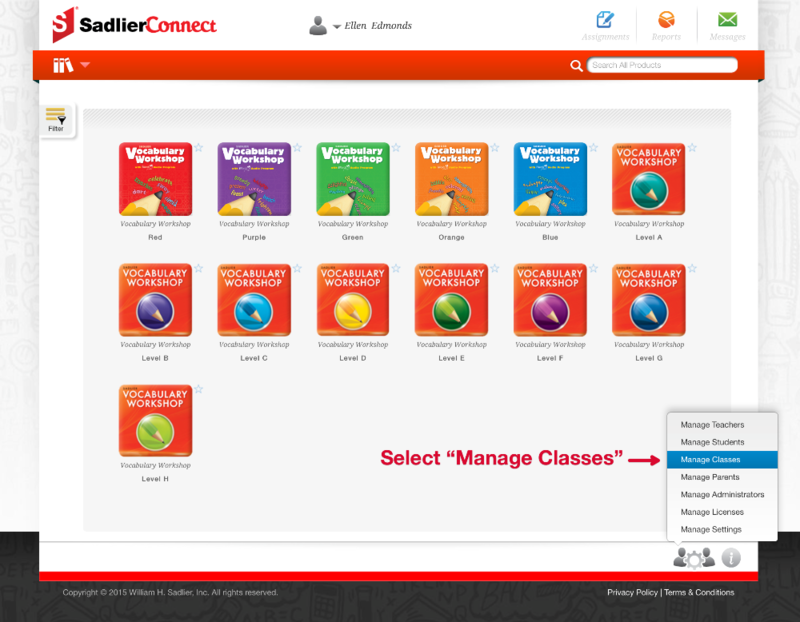 Column E - Teacher UserName (Required): You must provide a teacher username that exists in your Sadlier Connect account. If the teacher username does not exist, you will not be able to add this class when importing your file. Column F - Grade (Optional): This is a field to specify the grade level of the class. The acceptable values are: K, 1, 2, 3, 4, 5, 6, 7, 8, 9, 10, 11, 12. 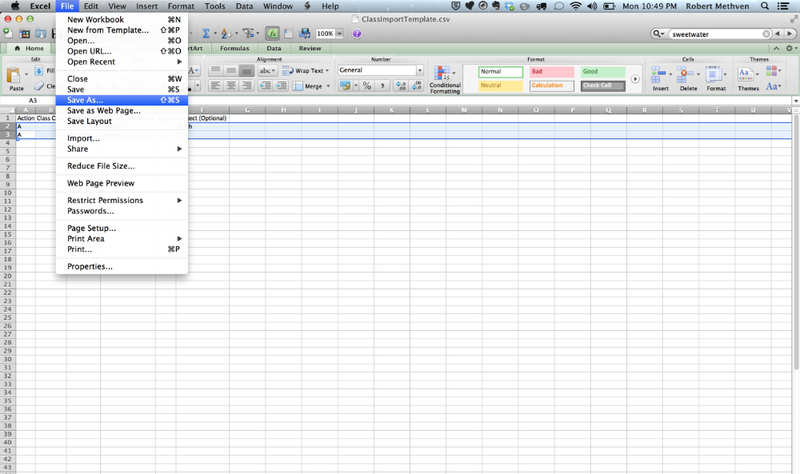 Column G - Subject (Optional): You can provide a subject area of your class if applicable. The acceptable values for this column are Math, ELA, Science, Social Studies, and Other.